SomeRightsReserved is the digital publishing platform for creative cooperative KithKin - read more at our Featured Commoner Interview. 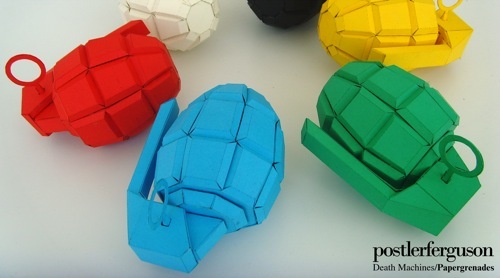 Whilst their collection of blueprints includes fairly industrious designs (such as the Street Sofa by WEmake which costs approximately £2000, and requires access to a welder and grinder to produce), the shop also stocks simple conceptual products (for example, the fold up Graphic Grenade by PostlerFerguson which can be made with just paper, a knife and glue). Image: RepRap, by Adrian Bowyer, CC BY-NC-ND 3.0 Unported, http://www.kith-kin.co.uk/shop/reprap/. RepRap is a self replicating rapid prototyper which can produce the parts needed to make another of itself. SomeRightsReserved allows designers to have greater creative freedom, flexibility, spontaneity, and control over the licensing of their product. Decisions on licences and price are made by the designers themselves. Of the 30 products listed, 26 are Creative Commons licensed, with the Attribution-Noncommercial-No Derivative Works 3.0 Unported version garnering the highest usage. In addition, all content on the website by default is licensed under the same CC BY-NC-ND licence. SomeRightsReserved is not ‘your high street supermarket stacking it high to sell it cheap,’ but ‘the little specialist shop that smells funny’. As a refreshing take on the traditional shop model, SomeRightsReserved is definitely a space to watch, especially with KithKin working to build their product listings, and diversifying their already fascinating collection.